This 1872 is a one of a kind variety. A four digit logo punch intended for a larger variety was initially impressed into the die. This photograph graciously provided by JT Stanton and the Cherrypickers' Guide. Note: It is possible, but unconfirmed that 1867WR TPD S1-3001 is also a small date over large date variety. 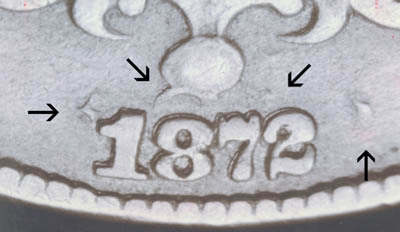 Note: Latest research confirms that the above mentioned 1867WR S1-3001 is a small date over large date variety.